Max and Noel Venning won Bar of the Year for Three Sheets and New Bar of the Year for Bar Three, with younger brother Max taking the title of Best Bartender. 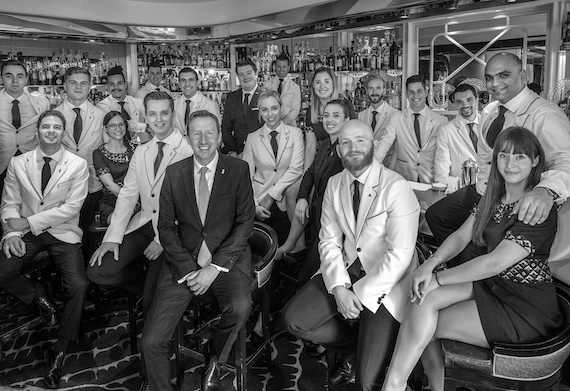 Declan McGurk from the Savoy’s American and Beaufort Bar was named Bar Manager of the Year and there were awards presented to bars from across the UK including London, Manchester, Edinburgh, Bournemouth, Sheffield and Birmingham. Industry legend Alessandro Palazzi of Duke’s Bar in London took the prize of Lifetime Achievement at the awards ceremony, hosted by CLASS editor Hamish Smith and Tristan Stephenson. Hailing from Manchester and with experience at Drink Factory and Bar Termini, Max Venning is one of two brothers behind three leading London bars – Three Sheets in Dalston, Bar Three in Spitafields and Little Mercies in Crouch End. Aside from the success of the Venning Brothers, Drinks Menu of the Year was won by Mr Lyan’s Dandelyan at Sea Containers for the third year running. Dandelyan, which is due to close in late March and be replaced by Lyaness, took the award for its fifth menu - The Modern Life of Plants, which is an ode to sustainability and modern agriculture. The Savoy's American Bar, headed up by Declan McGurk (pictured), beat Dandelyan and Cocktail Lounge at The Edgbaston to win Hotel Bar of the Year. Coupette in Bethnal Green, London again took the gong for Cocktail of the Year with its Apples cocktail. With cold-pressed, carbonated apple juice and a rotating calvados selection, Coupette’s Apples embraces the vagaries of seasonal produce and the quality and breadth of calvados. Specialist Bar of the Year went to whisky venue Black Rock for the third year in a row. Owned by Tom Aske and Tristan Stephenson, the contemporary basement bar with a collection of over 350 whiskies beat tiki bar Laki Kane and Calvados-focused Coupette. The Emerging Bartender of the Year category was won by Amber Blood, the young London-based bartender impressed judges with her menu writing skills at both her former bar Little Bat and current digs Callooh Callay. The hospitality skills of Coral Anderson of Swift in London saw her claim Front of House Star and Erin Davies from Nocturnal Animals in Birmingham won Back Bar Star of the Year. Other awards were presented to Terroir Tapas for the Sustainable Practices Award, Public in Sheffield collected the Bar Food Menu of the Year award, Edinburgh’s Bon Vivant won Restaurant Bar of the Year for the second year running and Crazy Pedro’s scooped up Social Media Presence of the Year.